If you are facing issues regarding iPhone repair in Toronto, you might as well consider fixing the problems yourself. In this article, we’ll talk about the iPhone repairs you can do yourself at home. Getting an iPhone repaired is a tedious task, and it may be heavy on your pocket. So here are some DIY fixes for the most common iPhone repairs. We’ll guide you step-by-step on how to repair the iPhone 5c home button flex. On a scale from 1 to 10. This repair difficulty is rated a 7. The estimated time for this repair is 25 minutes. I’ll personally recommend that you get an original screw mat if you want to save money and repair your iPhone at home. Don’t forget: with the original screw mat, you will never lose a screw again. Screw mat is available for most popular Android and Apple devices. Ensure your device is powered down. If the glass of your device is shattered severely, it’s best to use a suction cup to pull up the screen. If the digitizer is badly shattered, it’s best to use the metal spudger tool, be careful not to scratch up or dent the housing when prying up the LCD. Remove the for LCD screws with the double zero Phillips screwdriver. This is so you can unplug the LCD digitizer flex cables then remove the LCD digitizer shield. 5 unplug the three LCD digitizer flex, cables from the board. Remove the two Phillips screws from the proximity shield. After that, you have to remove the shield. Remove the flex safety tape, then remove the proximity front. Camera flex, with your plastic pry tool. Insert the proximity front, camera flex back into the LCD frame, make sure it’s securely inserted, or your proximity sensor will not work. Align ear speaker back into place. If the proximity shield needs a little bending to fit on the LCD frame. Now is the time to do so: align shield and insert the two Phillips screws. Plug all three LCD digitizer connectors back onto the board, align the shield and insert all four Phillips screws. Snap LCD digitizer back into the housing securely make sure everything is flush with the housing. Insert the two pentalobe screws back into the bottom of the housing. There’s going to be two different versions of this repair: we’re going to teach you the quickest version that includes, basically all the small parts it has the home button which is installed. It also has the ear speaker with proximity sensor flex all attached. So now we’re going to do the quick, easy repair first and then we’ll teach you the other version that doesn’t have the home button or the ear speaker proximity flex installed. That’s where you’d have to transplant everything from your broken one to the brand new one. First of all, take the two bottom screws out. They are located on either side of the charging connector. We’ll take those screws and put them to the side. Another really cool thing before we dive into this is we’re going to have our screw mat developed. It basically highlights all the screw locations and keeps you extremely organized. So you don’t have 25-30 screws rolling off the table, and you don’t know where they go because they’re all different sizes. So the first thing we need, we need to take the SIM card tray out. Go ahead and take your sim removal tool, which is also provided by phone doctors to you and your DIY kids. Now we would use our pentalobe screwdriver to take those two screws out. It’s already done, but now what we want to do is we’re going to use our metal phone opening tool. It is recommended that you purchase these phone repair tools from the internet. There is a seam between the aluminum middle frame and the LCD. Around the LCD, there’s a small little fine plastic seam that we want to get in between the plastic seam and the metal aluminum frame, and we want just to pierce in there. Siri can’t help us right now, but it probably would be really smart if you can turn the device off on this one. Unfortunately, in our case, we have no screen to turn it off, and the digitizer is not functioning. So we’re just going to move ahead forward with this. This is a whole lot different. This is kind of like returning back to the iPhone 3G 3GS method. This is just falling right apart where the 3G, 3GS, it’s a top-down construction, and so you start with the LCD, and it all starts opening from the top down. The iPhone 4 was backward. So you take the back plate off and move your way through all the way to the LCD. We’ll just go ahead and tear that off, and we’re going to come up underneath, real quick. Let’s turn it around make sure that we lift that metal plate with it. Now we’re going to hold it open just at the right place, and then we have a metal plate that you need to remove it quickly using a Philips screwdriver. Go ahead and remove these quickly. The screws aren’t really magnetized, but the screwdriver is. However, it is very important that you keep track of where your screws go. That’s why it’s going to be really advantageous for you to have a screw mat. Okay, now we’re going to use our plastic phone opening tool to make sure we’re not destroying anything. Now carefully come up underneath the camera, and we’re basically just going to kind of flick it up lightly and take the other one off, there are three cables: you have the LCD cable, the digitizer cable and then the proximity cable that also controls the ear speaker. Okay, so that’s that now our camera is flipped up just a bit. I want to go ahead and push that back down into its little compartment. Take our LCD, and we’re going to peel back these cables and get that third cable installed. First, you want to be really gentle doing this, make sure that you line it up correctly and then press it directly over that connector and you’ll feel it. It does have a couple of little sharp grooves here, and we have cables in it. So we want to be careful that we don’t pinch any cables or whatnot, but we just want to line it up over the holes. So we thread all the screws, nice and easy. It’s better that you don’t have to take everything out to replace the LCD on this iPhone 5 like the iPhone 4. So it will definitely save some time. You need to be careful with it because you don’t want to rip any cables. When you flip the back plate over, a little piece of glass might come out from the broken one before, so you would want to make sure that you have a clean surface area before you put the new assembly down. We want to go ahead and plant the top to make sure we get nice and fresh placing against the seam at the top and then we’re just going to slowly fold it down into place. Make sure that if there’s a little bit of resistance not much and then just kind of pop and clicked it back in. You don’t want to put a ton of pressure on one side and then potentially break this display, but have a go at it and do a hard reset before turning it back on. 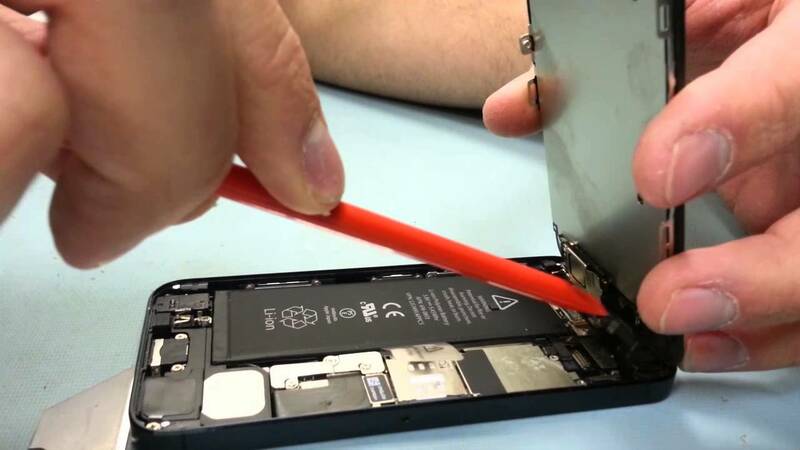 Here we will teach you step-by-step, how to repair the iPhone 5c’s old battery and replace it with a new one. The battery replacement on a scale from 1 to 10, is rated at a difficulty level of 6. The estimated time for this repair is 20 minutes. You will need the following tools to complete disrepair. You will need a good quality screw mat for this repair like all the other ones. Now, let’s get started on the repair. We have divided this repair into ten simple step. Follow these, and you shall now have any issues with the battery replacement. Unplug the three LCD digitizer flex cables from the board. Remove the two Philips screws to remove the battery shield and to unplug the battery flex, unplug the cable. The adhesive is very strong on the 5c battery, so pry up very gently and try not to puncture the battery and be very cautious. A punctured battery can burn you or start a fire. Then insert the battery and plug in the battery flex connector back to board.Align the battery shield and insert the two Phillips screws. Snap LCD digitizer back into the housing securely make sure everything is fitted in with the housing. This is one of the most old-school iPhone repair methods. You’ll need an iPhone 4 to perform this repair. It is basically carried out if you need to change the color of your home button i-e replace the old one with a new colored one. A little cosmetic home button piece attached to the home button is a small little flex cable that tucks, underneath and on the underneath side, plugs into a little flex connector. But we don’t want to undo that flex connector. It proves to be pretty difficult to get it reattached and so we’re going to be really careful with it. For that, we’re going to separate the home button from the little flex cable, and we’ll basically just peel it back towards ourselves and provide some room. Now right where the cable feeds on to the home button, we’re just going to gently start lifting that up off of the plastic home button, and you want to be really careful because you don’t want to rip that cable. Consider utilizing a wedge tool and just slowly just unpeeling it, because there’s 3m adhesive applied all along the bottom side of this cable. Now we’ll go ahead and put our white home button on. Now and if you turn it over you’re going to see a little plastic indention a little mold, that is the exact cut out of the shape of this flex cable. So we want to just kind of lay the home button straight on to the middle housing, and then we’re going to take the flex cable and gently just front peel. It pushes down right on top with the imprint that is on the home button. So it’s on accurately, and after that, we’re just going to fold it back over into placement and make sure that the home button is the square. You don’t want the home button to be cockeyed because then it’s going to look really funny. When you put the LCD on test with the button, makes sure it has a normal clicking feel to it, and that really it. So just to recap, you do have to take the LCD screen off. You do have to take the circuit board off to change out the home button. Basically, you peel it back towards you, take your black tool and just carefully separate the flex cable from the plastic home button and reattach with the new color of your choice.